Halloween night this year was a little colder and much wetter than in 2008, but Arlington still had a lot of party goers in costume out and about. After 11pm the rain stopped and the costumed action picked up. As with every year, Clarendon Ballroom, Mister Days and Clarendon Grill were the places to see and be seen in costume. 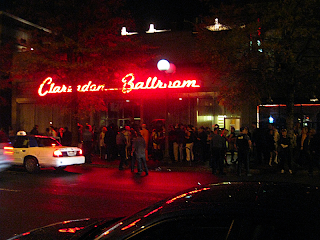 Lines were long in each venue, but none more so than at Ballroom with a queue all the way around the block around Eventide. Hailing a taxi was just about impossible at 2am when everything started closing up. It was great people watching witnessing the competing costumes trying to flag down a cab. Many fled to 24 hour restaurants to recuperate, and it was fun to watch Silver Dinner as it was full of half awake colorful costumes. We also hit up Alexandria earlier in the evening hoping there would also be some original get ups to gawk at there. Sadly the rain kept people away from Old Town mostly, except for an invite only event at Torpedo Factory. 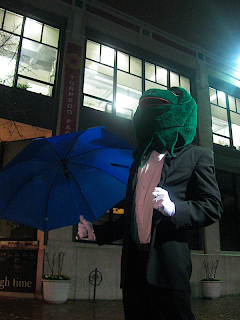 Tuxedo Frog made an appearance down by the water front, who was received as the best dressed there. Thanks to What's Happening in Arlington Village for the heads up. The race starts at 8am at the Christ Church of Arlington on North Pershing Drive. Map of the race route is here. 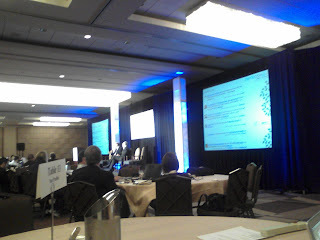 The Twitter for business convention TWTRCON took place at the Grand Hyatt in DC. The one day event featured dozens of interesting speakers talking about the uses of Twitter and other new social media for business, government, non-profit and charity uses. Hundreds of attendees represented everything from the Department of State to local customer service firms. Donors Choose is a charity that helps connector donors to classrooms in need. They gave out $5 donation cards to each attendee that they could redeem to the school of their choice. Charity: Water is an amazing charity that works to provide clean drinking to the 1 billion people in the world who are lacking clean water. Captain Sukach of the Air Force Public Affairs Agency told us interesting stories on how the military uses Twitter, and had a great quote of "if you are not failing you are not trying." Craigslist.com founder Craig Newmark participated and was also a fan of Donors Choose. He stated that in order to succeed, "print media needs to restore trust" with their audience. Portions of the night's $15 tickets will benefit the Fisher House Foundation. Thanks Delia for the heads up! Professionals in the City are running a "Taste of Clarendon" event to sample the fares at four of Clarendon’s restaurants: La Tasca, Restaurant 3, Ri Ra, Sette Bello. Cuisine varies from Spanish, Soulful Southern Cooking, Irish and Regional Northern and Southern Italian. The event lasts from 2 to 6pm on November 1st and is $49 if tickets are purchased by this Friday on their website. Eleventh Street Lounge is one of my favorite venues in Clarendon, as it is a little more classy and tasteful than the typical bars and clubs packed with the identical post-college drunkards. Known for its techno music DJ's, warm red interior, and a speak-easy like basement section, Eleventh has added another feature to make it even more attractive. 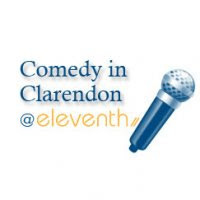 Every first and third Mondays of each month the lounge hosts an open mic comedy standup, with comedians ranging from beginners to veterans. The open mic that starts at 8pm. More info at their site or their Facebook event page. Local indie/experimental/rock group True Womanhood will be performing at Black Cat again! Black Cat praises TW as "definitely different. Tons of drums, a few homemade instruments, and some well-placed pop hooks makes for an experimental, energetic, and very entertaining show. Who doesn't love a band that loves double kick drums AND crafts?" Don't miss them and the Grooms tonight at 9pm! GWU's ISTM program is hosting its first alumni happy hour on Wednesday, October 28. Rub shoulders if you are a GeeDub graduate from 5 to 8pm at Mister Days. Local non-profit One Brick DC is having their annual fundraiser party this Saturday night at the Hawk and Dove. One Brick is an 100% volunteer organization that brings volunteers together to support over 600 organizations. The night features an open bar, DJs, prize raffle, and a chance to win a trip for two to San Francisco. 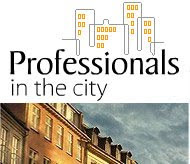 View the Evite here for more details about this event. David Sedaris was as awesome as expected at Lisner on Wednesday (Oct 7, 2009) night. He's been working on a book of fables, or... as he said it.... "a book of stories with animals, since fables usually have a lesson to be learned and his stories don't" and he shared a few of those yet-to-be-released ditty's with the crowd. He also suggested that the attendees invest in The Onion's book Our Dumb World, and after listening to a couple excerpts, the attendees agreed. He opened with political satire that was edgy to the point of hilarious, finished by candidly answering audience questions, and provided the most ROFL moment possible by reading from his diary. Hugh is a patient and lucky man. Side Items: Traffic (should have metro'd) on 66 was as pleasant as ever. There was no street parking for miles around GW but parking garages were decently priced. There's only one set of restrooms at lisner but the lines move quickly. We were about 3/4 of the way back from the stage, and the view was fine. Overall great night/show. Tonight EatBar hosts its for its Sunday movies series, featuring The Sound of Music show and sing-a-long. Enjoy the classic with bratwurst and free beer steins. This free event starts at 8pm. Next week EatBar will be showing The Princess Bride. Thirteen restaurants will be participating in the Old Town Wine Festival this Saturday and Sunday, Oct 10-11 11am to 6pm. Twenty wineries will be contributing their products for tasting at two locations in Alexandria. Tasting tickets are $35 and general admission is $15. Come out tonight after work from 6:00pm - 8:30pm for a happy hour at The Rookery in DC to raise awareness about United Cerebral Palsy (UCP). "As one of the largest health charities in America, the mission of United Cerebral Palsy is to advance the independence, productivity and full citizenship of people with disabilities through an affiliate network. UCP affiliates serve more than 176,000 children and adults with disabilities and their families every day." Come out to Mister Days tomorrow night from 6:00-9:00 PM to help support the Leukemia and Lymphoma Society and Team in Training at the 'Charity, Cheers, and Beers' fundraiser! This Saturday Welburn square hosts the last Ballston Arts & Crafts Market this season. Located just next to the Metro station, it features one-of-a-kind handmade works by local artists. This event runs every second Saturdays May-October 10am-4pm, with this Saturday being the final event of the year. "Throughout the day, you'll visit many landmarks in D.C., restaurants, schools, theaters, and much much more! There are plenty of items to collect and mysteries to solve and what you see depends upon your team's resolve, speed and ability to have fun! All teams must use public transportation. Teams caught using personal cars will be disqualified." Price is $25 per person if purchased by the Friday. The Army Ten Miler race concluded today under an incredibly blue sky and perfect running conditions. 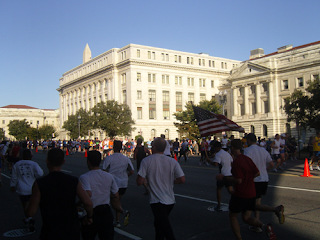 This was the 25th annual race that began and ended near the Pentagon. I was near the Smithsonian Metro station that marked the 5.5 and 7.5 mile markers, due to racers turning around in front of the capital. This was a great place to watch the race as you had two chance to pick out your friends amongst the dense crowds. Congrats to all the 21,256 runners! The Cheesecake Factory is known for its large portion sizes, good service, and if being over-hyped and tacky. But they also have a surprisingly rich Sunday only brunch menu. While most people are flocking to Whitlows and waiting for a table at their breakfast buffet, it is a nice change of pace to be seated immediately for brunch at Cheesecake. 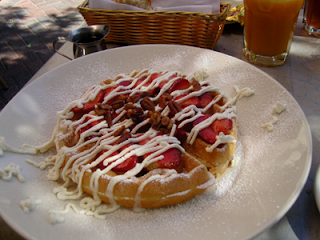 Pictured is their Giant Belgian Waffle with all the optional toppings, which looked deliciously more like desert than breakfast. Being Cheesecake Factory it is a little pricey, but i recommend it for a special treat brunch alternative. Middle Distance Runner is making another appearance at Iota tonight! They put on an awesome live show at their last trip to Clarendon. Brightest Young Things just put out an extensive review of their new album The Sun & Earth featuring sound clips of every track! Its great that such a talented band is getting more publicity, and look forward to seeing them tonight for their record release. CHANTILLY – The Virginia Department of Transportation (VDOT) will delay reversing the I-95/395 High Occupancy Vehicle (HOV) lanes this weekend for the annual Army Ten-Miler race Sunday in Arlington and Washington, D.C. The HOV lanes will remain open to all motorists southbound from 6 p.m. Friday, Oct. 2 until 1 p.m. Sunday, Oct. 4. The lanes will close to all traffic at 1 p.m. and reopen northbound to all motorists at 3 p.m. (The lanes are usually open southbound until 2 p.m. Saturdays, reopening northbound at 4 p.m.). This is to advise the public that from 8 am until approximately 11 am on Sunday, October 4, 2009, streets in the downtown area of Washington, DC will be affected by the 25th Annual Army Ten-Miler.